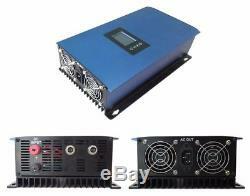 1000W Solar on Grid Tie Inverter with Power Limiter DC 22-65V/45-90V PV system. 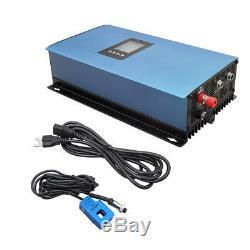 Bullet Point 1000W Solar on Grid Tie Inverter with Power Limiter DC 22-65V/45-90V PV system. Item Details: 1000w Solar Power Grid Tie Inverter. With Limiter / Sensor Battery Discharge Power Mode. DC 22V-60V or 45V-90V (optional). AC 110V 120V 220V 230V 240V (auto selected). Why we produced the GRID TIE INVERTER WITH LIMITER? It is in response to the overwhelming clamor from our customers for a product that can control the amount of power that the grid tie inverters (GTI) can generate so that the amount of excess power produced by the solar panels are reduced to insignificant levels, if not eliminated --- because in some countries, the producer pays for the excess power it gives to the distribution grid. This is because the electric power meters (the one provided by the electricity provider in the area) are not aware of the direction of power flow. In other words it only adds even if power is exported to the grid, thus, the consumers will be charged for power even if it is given to the grid, and this is the problem This is the 2nd generation grid tie inverter with limiter. But in case customer install inverter far away from the main circuit breaker, we also enable the 2nd GTIL work with stand-alone limiter, we call this-external limiter. User can set the maximum output power of inverter , this can make the inverter work at cooler contition as user want and extend the lifespan of the inverter. User can set kick in/off voltage of the inverter which can flexible using with battery bank depend on users mind and can prevent battery bank from over discharged. #1 Solar on grid tie inverter. Dimensions (W x H x D). Note: there are 22v-60v and 45v-90v input voltage optional, Please choose DC22v-60v or 45v - 90v. Description: a: DC input , for solar panels connection b: Connector for external limiter c: Connector for internal limiter d: AC output , use AC cable to connect to home grid Sensor Clamp. How to use the Inverter? Standard Grid Tie Inverter Model(one unit inverter). More than 1 unit inverters stackable. The Grid Tie inverter converts DC power produced by Solar Panels to AC, connects to the grid and feed all of the power available from the panels to the AC load. All excess power that is not needed by the load is then exported to the Grid. If the Grid fails, then the Grid Tie Inverter will turn off. When the Grid comes back on line. The Grid Tie Inverter will again supply power to the load and any excess power is exported to the Grid again. If the Solar Panel is producing less power and the GTI cannot deliver all the power needed by the load, then power will be supplemented by the Grid. Power Meters (Except smart meter) are not aware of the direction of Power flow. The user then pays for the power exported and delivered by the Grid. Using Grid Tie Inverter With Limiter Model. 2.1 The Grid Tie Inverter with Limiter delivers only the power needed by the load and prevents delivering excess power hence avoids excess power in going back to the Grid. 2.2 The heart of the Grid Tie Inverter with Limiter is the Limiter Module (LM). The LM continuously sampled the power needed by the load through the current sensor connected after the Main Circuit Breaker. The LM then will process the signal. It then sends signal to Grid Tie Inverter how much power to deliver to the load in real time. 2.3 The user, after installing and connecting the GTIL correctly, need not do anything and the unit will do its work automatically. Installation of GTIL With Internal Limiter. 3.1 This installation is not require an additional limiter module, Installation is much easier. Clamp the current sensor cable to the hot wire to measure the current, the internal limiter will auto detect the load power and control the inverter output power, excess power will be well controlled. 3.2 External protective device including dc and ac SPD(Surge protection device), dc and ac breaker, etc is recommended to installed in the system. Limiter Setting on the LCD of the inverter: The GTIL include three working mode:Work as normal GTI without power limitation. Work under Internal limiter mode and Work under External limiter mode, Pls make your setting on the LCD and save it, details setting operation, pls read the GTI manual. 5 Battery Discharge Power Mode New upgraded firmware enable battery or solar limiter current and power model. Clamp sensor signal- 5v AC max mA. DC signal Cable- 5v DC, max mA. Fengefengefenge If the distance of meter and inverter is too long , you will need the External Limiter. Note: The external limiter is not included in package. #2 Wind on grid tie inverter. With dump load controller and resistor. Max Efficiency:>92% /MPPT Efficiency:99%. DC/AC 22V-60V / 45V-90V (selected). AC 100V 110V 120V 220V 230V 240V 50hz 60hz. Low cost and easy installation. Directly connect to three phase wind turbine. Much better output waveform compare with similiar GTI. Improving the efficiency of the entire solar power system. AC output voltage and current THD<5%, PF>99%. Build in dump load function. Build in Limiter (internal type). Introduction of Sunshine Grid Tie Inverter for Wind Turbine. The Wind Grid Tie Power Inverter is the worlds most technologically advanced inverter for use in utility-interactive applications. This manual details the safe installation and operation of the The Wind Grid Tie Inverter. This integrated system maximizes energy harvest, increases system reliability, and implifies design, installation and management. The small type wind grid tie power inverter can obtain the wind energy from wind turbine, and can tie to the grid through its output cables with no extra equipment. The installation is very convenient and reliable. We call the system combining with small grid tie inverter and wind turbine as SGWT. The system includes wind turbine and small grid tie inverter and installation kit, and some SGWT also will include controller, dump load resistor. The inverter can be connected to any outlets of utility grid at house. The small grid tie inverter monitors the volume, frequency and phase of the home utility grid, then produce pure sine wave AC power that the frequency and phase are as same as the grid's, and the volume is a bit higher than the grid's, then according to the current controlled PWM, to control the output power to the grid. The small grid tie inverter just puts out power when the home grid is on. When the wind turbine is rotating, and the output of the voltage is in the range of the rated input voltage of the inverter, the wind turbine will produces power, and the grid tie inverter will change the power from wind turbine to the home grid. When the total power of electric apparatus that are using in the house is larger than the output power of the inverters, these. Power from the inverters will be consumed in the house, this will slow down the power meter, otherwise, the difference of the output power of the inverter between the total used power of the apparatus will go out from the house to the out grid. Input Voltage Range:22-60vdc/45-90vdc (test point is at the output of the inside rectifier) , Peak power tracking voltage:25-60v/50-90v , Max output power:1000w , Nominal Voltage Range: 95-140v/185-265v , Max Efficiency:>92% , MPPT Efficiency:99%. Input AC DC Voltage Range. Wind Grid Tie Inverter Installation. Considering the total capacity of the grid tie power system that you need. The total capacity of the whole grid tie power system is according to your power consumption in the site that you want to install, or how much power that you want it to feed to the utility grid. Actually, the volume is just according to your willingness, because when the total power of electric appliances that are being used in the installation site is larger than the output power of the grid tie power system, these power from the system will be consumed in the site, this will slow down the power meter, otherwise, the difference of the output power from the system between the total used power of the appliances will feed to the utility grid. For example, if you want to install a grid tie power system in your house, you could decide the total power volume according to the total power the appliances that you use in your house, maybe the consumption of total energy in per day is about 5KWH, then you should realize the averaged speed of the wind in per day at your site, check the power to the speed of the wind curve from the specifications of the wind turbine, then you can estimate the average power that the wind turbine can generate, actually the real average power the wind turbine can generate at your side is not easy to estimate, you need to check the history data of the climate, because it will vary every day according to the climate, just assume a 1KW rated wind turbine is suitable for the grid tie power system that you plan to set, with this capacity of the system, it can supply all power consumption in whole year. When grid tie power system is working, sometimes, there is extra power feed to utility grid if the power from the grid tie system is larger than the power consumed by the appliances in your house, and sometimes will not when it is not larger. If you use a 1KW wind turbine, then we call the GTWT system is 1KW grid tie power system, of course, you can install 500W grid tie power system or 2KW grid tie inverter, even more large capacity or more small capacity grid tie inverter, it doesnt matter. But ifthe capacity is too big, you should consider the volume of AC system of your house can hold the feeded power. 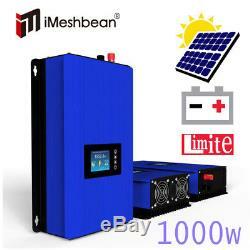 Choosing applicable wind turbine for Sunshine Grid Tie Inverter. The most kinds of specifications that the factories marked about the wind turbines. 1, Starting wind speed(m/s). 2, Cut-in wind speed(m/s). 3, Rated wind speed(m/s). 6, Safe wind speed(m/s). You need to choose a wind turbine that the rated power can meet the power consumption for your using. When you choose a wind turbine, you also need to consider ahead what model gird tie inverter of SUN series you want to use. Wind turbines have two output type, one is AC output type, and another is DC output type, if the wind turbine is DC output type, it must be integrated with a rectifier. So if the wind turbine is AC output type, you should use WAL model of SUN series grid tie inverter, if the wind turbine is DC output type, then you should use WDL model of SUN series grid tie inverter. Selecting accessory for installation of the Grid Tie Power System. The accessory for grid tie power system including. 1, Connecting cables will be connected with wind turbine and inverters. 5, Bracket for wind turbine installation(not included in this user manual). Selecting correct model of Sunshine Grid Tie Inverter. When finished step1 to step3, then you can select a correct model of SUN series inverter. If the wind turbine is DC output type, then you should choose WDL model inverters, and the input DC voltage range of the inverter should fit the DC output voltage of the wind turbine, the rated power of the inverter should also fit the max. Power of the wind turbine, and the AC output of the inverter should fit the standard of AC utility grid. If the wind turbine is AC output type, then you should choose WAL model inverters. Most factories dont supply the AC rated voltage, just supply DC rated voltage, so our WAL also supply the DC input range, please check the DC rated voltage of wind turbine should fit the DC input range of the grid tie inverter. Installing wind turbine to suitable place. Installing the wind turbine of the SGWT to suitable location where the wind is strong enough to drive the wind turbine. Warning: Please read the user manual of wind turbine before you install the wind turbine, dont install the wind turbine under high wind. Warning: Ensure using strong braket to fix the wind turbine to avoid the danger under high wind. Warning: The blades of the wind turbine should be taken down before the hurricane is coming. Installing Sunshine Grid Tie Inverter to suitable place. Place the Grid Tie Inverter on a surface protected from direct sunlight, high temperatures, and water. The inverter requires at least 150mm of clearance around itself for ventilation. The inverters are for indoor use, cant use at outdoor. You can use screws to fix the inverter to the surface, because some models of Sunshine grid tie inverter have fans on the bottom cover, so the surface should be flat. Connecting Sunshine Grid Tie Power System with cables and connectors. Connecting the Grid Tie Power System with Cables and Connectors After finished from Step1 to Step6, you should connect the wind turbine and inverter with cables and connectors to integrate the Sunshine Grid Tie System. Connect the ground terminal of the wind turbine to the NEC approved AC grounding electrode. Connect the grid tie inverters to the grounded racking using a grounding washer approved for the racking. The ground wire of the AC cables is connnected to the housing of inverter when the AC cables is connected to the inverters, so when the AC plug is inserted to the socket of AC outlet of utility grid in the house, the ground pin of the socket must be connected to the Earth ground. Connecting the wind turbine output cables after complete from Step1 to Step8. Warning: Before connect the wind turbine output cables to grid tie inverter, you should stop the the rotating of the wind turbine just in order to avoid the sparkle when connect the cables. We are not responsible for undeliverable address. Pleas message us if recipient address changes needed before we fulfill the order. Sorry, no local pickups available. No need return the original one for low-valued items. All return products should be in original package with all accessories included. We stand behind our products so you are always covered! The item "New 1000W Solar/Wind Turbine on Grid Tie Inverter with Power Limiter PV system" is in sale since Monday, October 9, 2017. This item is in the category "Home & Garden\Home Improvement\Electrical & Solar\Alternative & Solar Energy\Chargers & Inverters". The seller is "chargerangel" and is located in Pasadena, Texas. This item can be shipped to United States.